A few years ago, I was a judge for a competition on scenario-based learning. While there were a few terrific submissions, I thought many of the courses missed the whole point of scenario-based learning. They started out fine: they provided some sort of realistic context and asked learners to make a decision. Then, instead of showing them the consequences of their decision, they just provided feedback as if it was any other multiple choice assessment. “Correct, that is the best decision.” Blah. Boring. And ineffective. , Ruth Clark labels the two types of feedback “intrinsic” and “instructional.” Instructional feedback is what we see all the time in e-learning; it’s feedback that tells you what was right or wrong and possibly guides or coaches you about how to improve. With intrinsic feedback, the learning environment responds to decisions and action choices in ways that mirror the real world. For example, if a learner responds rudely to a customer, he will see and hear an unhappy customer response. Intrinsic feedback gives the learner an opportunity to try, fail, and experience the results of errors in a safe environment. Intrinsic feedback is one of the features of scenario-based learning that sets it apart from traditional e-learning. When you show learners the consequences of their actions, they can immediately see why it matters. The principles or process that you’re teaching isn’t just abstract content anymore; it’s something with real world implications and it matters if they get it wrong. It’s more engaging to receive intrinsic feedback. Learners are also more likely to remember the content because they’ve already seen what could happen if they don’t make the right choices. Intrinsic feedback can take a number of forms. Customer reactions (verbal and nonverbal), patient health outcomes improving, sales figures dropping, a machine starting to work again, and other environmental responses can be intrinsic feedback. 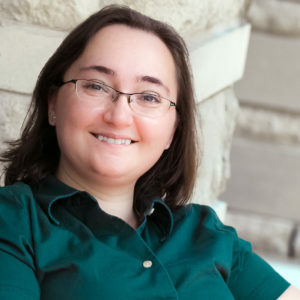 The example below contains three pieces of intrinsic feedback, all on the left side: a facial expression, a conversation response, and a motivation meter at the bottom. 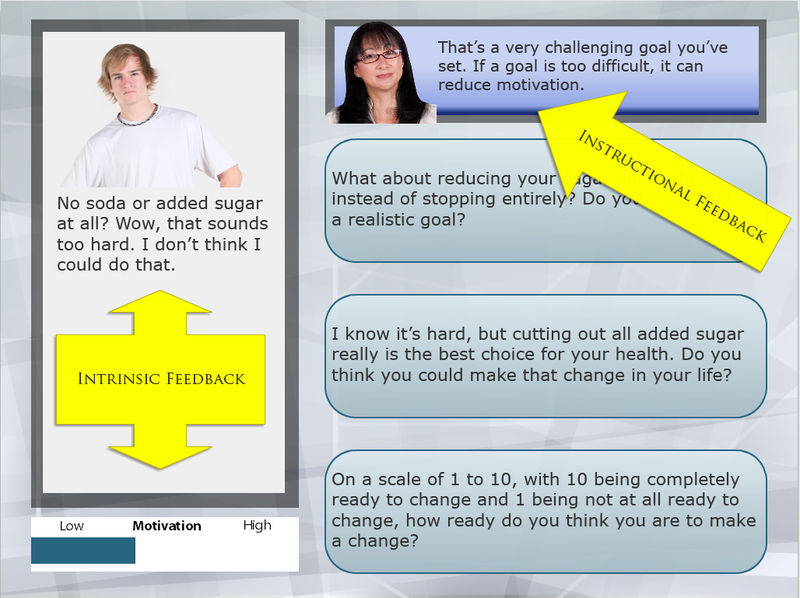 In this example, learners are trying to convince someone to make healthier eating choices using motivational interviewing. Motivation level is an “invisible” factor, so I made it visible with a motivation indicator in the lower left corner. As learners make better choices and the patient feels more motivated to change, the motivation meter shows their progress. Scenarios can also use instructional feedback. In the above example, a coach at the top provides instructional feedback and guidance on learners’ choices. Clark recommends using both intrinsic and instructional feedback in most situations. One issue with instructional feedback is that it can break the realism of a scenario. Using a coach can help alleviate that problem, as can having learners ask for advice from people inside a scenario (a manager, an HR rep, another worker, etc.). Using a conversational tone for the instructional feedback also helps keep it within the scenario. Instructional feedback in a scenario often doesn’t need to explicitly say that a choice was correct or incorrect; that’s clear enough from the intrinsic feedback. Focus your instructional feedback on explaining why a choice was effective or how it could have been better. Feedback can also be delayed rather than happening immediately. Clark recommends more immediate feedback for novices but delayed feedback for experts or more advanced learners. Depending on the audience, for some branching scenarios I do immediate intrinsic feedback for each choice learners make. When learners make bad choices that cause them fail and they need to restart the scenario, they receive instructional feedback with guidance on how to improve on their next attempt. They might be able to make two or three bad choices in a row before they hit a dead end in the scenario, so the instructional feedback is delayed. It keeps the momentum of the scenario moving forward but still provides support to learners to help them improve. If you’re building scenario-based learning, don’t leave out the intrinsic feedback! Your learners will thank you. Great points, Christy. Intrinsic feedback can sometimes be a bit tougher to work out with the SME but you provide a couple of good examples here. It can be harder to work out with the SME. I’ve had decent luck asking questions like “What would happen if they got this wrong?” or “How would a customer react to this?” Sometimes it’s easier to just guess and make something up. I often get it right, or at least close. Even if I’m completely off the mark though, it’s sometimes easier for a SME to fix my mistake than to come up with something from scratch.